Boston, Massachusetts based medical malpractice law firm Lubin & Meyer PC has achieved four multi-million dollar jury verdicts in the first half of 2018. This includes a rare gross neg­ligence verdict. Full trial reports are not yet available on all verdicts, however, the following links contain more information about these four trials. $3.2 Million Verdict for family of MGH patient for doctor's failure to inform patient of all treatment options following abnormal biopsy result. $1.6M Verdict for Medical Mistake at Dana Farber - Jury decides in favor of patient suffering 3 years of renal failure and dialysis resulting from Dana Farber medication error. Lubin & Meyer attorneys also represent clients in New Hampshire and Rhode Island. New Hampshire law firm Gallagher, Callahan & Gartrell has announced that Donald J. Pfundstein has been named as Concord's 2018 "Lawyer of the Year" for Government Relations Practice by Best Lawyers®. Attorney Pfundstein focuses his practice on the regulated industries, and frequently appears before executive agencies including the NH Insurance Department and NH Public Utilities Commission. He also has extensive experience representing clients before the Energy Facility Site Evaluation Committee and the New Hampshire Legislature. Gallagher, Callahan & Gartrell, PC, is a leading business and litigation law firm with a lobbying presence in Concord, New Hampshire. Massachusetts personal injury law firm Lubin & Meyer has doubled its leadership gift to the MCLE New England, which has enabled lawyers to attend nearly 50 MCLE (continuing legal education) programs over the past five years. By committing another $25,000 to the Lubin & Meyer Scholarship Fund the firm has effectively doubled the fund’s impact. The fund will now provide 20 scholarships to MCLE programs every year for lawyers who serve the public interest. Five years ago, the Lubin & Meyer extended its support to the training of those who serve the poor with a leadership pledge of $25,000 to MCLE’s scholarship program, helping MCLE reach the initial $2.5 million milestone. That gift helped to strengthen the foundation of an endowment that has now exceeded $3.3 million towards a $5 million goal to endow 2,000 scholarships annually for the benefit of legal aid staff attorneys, private practitioners who accept pro bono cases, and other deserving lawyers who — without financial assistance — would not be able to attend MCLE programs. For more information on the scholarship, contact MCLE New England. Collden Farm is a Phase II residential single-family clustered subdivision in Wolfeboro, NH for sale. The fully approved subdivision is located near the Ossippee / Wolfeboro line and is 15 minutes from downtown Wolfeboro. Consisting of 15 approved lots, it is being offered in its entirety to a developer/builder. 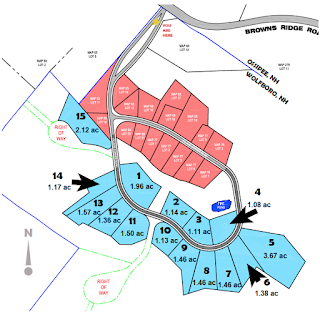 "The first phase was made up of 18 lots (two were merged into one) averaging about .75 acre each. At present there are 14 homes. The new phase has 15 lots, which average 1.5 acres. There is one premier lot (#5) which is 3.5 acres and located on top of a knoll with 360 degree views. All lots are designed for single wells and septic and “perc” tests have been performed. Septic design would be the responsibility of the builder." For information including permits and plans, visit the Collden Farm Phase II website at nh-buildinglots.com. For pricing information, contact the owner’s agent: David B. Campbell at 603-883-1100. NH real estate attorney Erik Newman has published an update on New Hampshire laws affecting condominium unit owners' associations that may require amending condo bylaws to incorporate the new requirements. In NH Condo Law: Enhanced Governance Requirements Take Effect for Condominium Associations, Newman outlines significant changes to the way condominium owners' associations (COA's) elect officers and directors, conduct meetings and adopt budgets under the New Hampshire Condominium Act, RSA 356-B, became effective on August 1, 2016 and can be reviewed on the New Hampshire General Court’s website at: Chapter 311 HB 353 - Final Version. The new law states that in the event of a conflict with an association’s existing declaration and bylaws, the provisions of the Condominium Act shall control, suggesting that bylaw amendment may not be necessary. However, several of the changes impose new content requirements for bylaws, which, if not already present in your bylaws, would necessitate amendment to comply. BOSTON — Amy Campbell, principal of Infoworks!, is pleased to announce that the firm has been selected for a 2016 WebAward for the "mobile-first" responsive website redesign of christinehamori.com. The website was built for Duxbury, Massachusetts plastic surgery client, Christine Hamori Cosmetic Surgery + Skin Spa, received an "Outstanding Achievement in Web Development" award in the Medical industry category from the Web Marketing Association's 2016 web design competition that judged websites in over 50 categories. A website project was a mobile-first redesign — it aimed at capturing the search engine optimization (SEO) success of the past site, while updating the look and enhancing ease-of-use and ease of contacting the practice on-the-go. The emphasis for the design was on simplicity of presentation and depth of information. Marketing content favors education over sales pitches and employs informative multimedia content — video, animation, text, and before-and-after photos. Christine A. Hamori, MD, FACS, a board-certified plastic surgeon who has been in private practice for 15 years on Boston’s South Shore, has launched a new website dedicated solely to female genital aesthetic surgery and vaginal rejuvenation treatments. Labiaplastyboston.com is a spin-off of her general practice website (christinehamori.com). Dr. Hamori, who has performed more than 400 labial surgeries has developed special expertise in labial surgeries and has lectured internationally and in the US to educate her peers at plastic surgery conferences. A popular course that she has been teaching to other surgeons for the last 10 years is "Labiaplasty and Beyond” in which she describes anatomy, surgical techniques and ways to avoid and treat complications of labia surgeries, which include labia majora reductions and clitoral hood reductions in addition to labiaplasty — also called labia minora reduction. "There is a lot of conflicting information available online," said Hamori. "I wanted to create a discreet place where women can come and understand their options." Patients seeking these surgeries come to Dr. Hamori’s practice on Boston’s South Shore from all over the world. In July Governor Maggie Hassan signed into law a bill modernizing and simplifying New Hampshire’s Banking Laws. The new laws go fully into effect on October 1, 2105, although some went into effect in July. NH banking attorney John Funk said, "The existing laws had become outdated and cumbersome and interfered with the ability of banks and credit unions to serve their customers’ needs." Funk served on the working group that developed the new laws, representing banks. According to Funk, nearly 25 separate chapters, some of which were over 100 years old, were reduced to 5 separate chapters. These chapters are distinguished from each other by the type of bank or credit union they regulate. RSA Chapter 383-A establishes a set of requirements that apply to all banks and credit unions. RSA Chapter 383-B governs NH depository banks, both mutual and stock, and the holding companies that own them. RSA Chapter 383-C governs NH trust companies which are classified as banks, but are not authorized to accept deposits. RSA Chapter 383-D governs a sub-set of trust companies known as NH family trust companies. These are private companies that serve the needs of the members of one family. The family members are defined by their relationship to a designated person. RSA Chapter 383-E governs credit unions which are owned and operated by their members. They are different from banks, sharing some powers, but limited in others. Attorney Funk has authored a series of articles that explain the new laws point by point as well as an overview of the new laws. CONCORD, NH — Gallagher, Callahan & Gartrell, P.C. congratulates Primary Bank and its Organizers for forming a new bank, raising over $25 million in capital, and opening its doors for business. The Bedford, NH-based bank is the first to be created in New Hampshire in seven years, and is poised to serve the state's small businesses and consumers. Banking attorneys W. John Funk, Dodd Griffith and Susan Hollinger advised Primary Bank in this transaction and have extensive experience in advising financial institutions and other businesses on raising capital and complying with federal and state securities laws and all aspects of state and federal financial institution regulation. NH Banking Commissioner Glenn Perlow signed the Certification to Transact Business on July 28, 2015, the final authorization to allow the New Hampshire state-chartered Primary Bank to begin business. Primary Bank is only the second bank chartered in the United States since 2010. BOSTON — The Legal Sales and Service Organization (LSSO) has announced new sales and service awards for the legal industry. The awards — Sales & Service Team of the Year and Sales & Service Executive of the Year — will recognize both the individual and team efforts that played a significant role in helping retain and grow a law firm’s revenue through a specific sales achievement during 2014. The awards sponsor, Berbay Marketing & Public Relations, will present the awards at its 12th Annual RainDance Conference, the senior-level conference for today’s law firm business development and service leaders, to be held June 10-11 in Chicago, Illinois. All full-time, in-house law firm professionals may apply for the awards. Sales or client service team firm leader. Sales or client service team manager supporting the firm’s leader, and possibly responsible for a client team program, office or practice. For more information on the awards and to download an application, click here. WALTHAM, MA — Noted trial attorney John Tumilty has joined the Waltham-based law firm of Morse, Barnes-Brown & Pendleton, PC as a member and will chair the firm’s newly-expanded Business Litigation Group. Formerly a partner at Edwards Wildman Palmer LLP, Tumilty has earned a reputation as a particularly skillful litigator in handling complex business and commercial disputes for companies, partnerships, and individuals. Morse, Barnes-Brown Pendleton, PC, focuses exclusively on the core legal services that businesses need to succeed. The law firm assists businesses of all sizes — from start-ups to Fortune 1000 companies — in the areas of corporate law, intellectual property, licensing and strategic alliances, employment and immigration, taxation and litigation. BOSTON, MA — Lubin & Meyer PC has received two "Tier One" Best Law Firms rankings from U.S. News & World Report and Best Lawyers® for 2015. The firm was recognized in two practice areas receiving "Tier One" rankings in personal injury litigation and medical malpractice law. "Tier One" is the highest ranking a law firm can receive in the Boston metropolitan area. To be eligible for a Best Law Firms ranking, a firm must have a lawyer listed in The Best Lawyers in America, which recognizes the top 4 percent of practicing attorneys in the US. Lubin & Meyer has five attorneys named Best Lawyers® for 2015: Andrew C. Meyer, Jr. (selected 2011 "Lawyer of the Year" for medical malpractice); Robert M. Higgins (selected 2015 "Lawyer of the Year" for medical malpractice); Adam R. Satin and Krysia J. Syska for medical malpractice law; and William J. Thompson for personal injury litigation. According to Best Lawyers®, achieving a "Tier One" ranking signals a unique combination of quality law practice and breadth of legal expertise. WALTHAM, MA - Veteran Boston-area attorney, John Hession has joined business and IP law firm Morse, Barnes-Brown & Pendleton, PC (MBBP). Hession is a noted VC and attorney serving the technology and life science sectors who served previously at Cooley, LLP, and Testa Hurwitz & Thibeault. “John’s stellar reputation, his expertise, and his widely admired skills made him an attractive target in the context of our plan for growth,” said MBBP Managing Partner Lisa Warren. Hession recently authored: Forging Successful Strategic Alliances for Life Sciences Companies. Morse, Barnes-Brown & Pendleton, PC, focuses exclusively on the core legal services that businesses need to succeed. The law firm assists businesses of all sizes — from start-ups to Fortune 1000 companies — in the areas of corporate law, intellectual property, licensing and strategic alliances, employment and immigration, taxation, and litigation. Charles P. Bauer, a New Hampshire litigation attorney and mediator, has been named Best Lawyers® 2015 Lawyer of the Year for Mediation - Concord, NH. As one of the Granite State's foremost trial attorneys, Charlie's law practice includes civil rights litigation, private mediation and arbitration, employment litigation, and other complex civil litigation in federal and state courts and administrative agencies. Charlie is experienced in private mediation and arbitration, is a fellow in the American College of Civil Trial Mediators and a member of the National Academy of Distinguished Neutrals. He has served as a member of the New Hampshire Bar Association Ethics Committee, Dispute Resolution Committee and Mentor Program. He also has served on the federal court and state court mediation programs. He is also listed by The Best Lawyers in America® in the field of Arbitration. BOSTON — Tax attorney Robert M. Finkel has been named Best Lawyers® “Lawyer of the Year” in the practice area of Tax Litigation and Controversy - Boston for 2014. Only a single lawyer in each practice area and designated metropolitan area is honored as the Best Lawyers® “Lawyer of the Year.” Attorneys honored as “Lawyer of the Year” are selected based on top voting averages received during an exhaustive peer-review assessments conducted with thousands of leading lawyers each year. The Lawyer of the Year designation reflects the high level of respect a lawyer has earned among other leading lawyers in the same communities and the same practice areas for their abilities, their professionalism, and their integrity. Attorney Finkel has more than 25 years experience as a tax and business lawyer, with his practice focused on the areas of individual and business taxation including tax controversy and tax litigation. He advises clients on the tax aspects of a wide range of business transactions. Robert also advises Israel-based high tech companies on U.S. operations and financings, and advises not for profit and charitable organizations on a variety of issues. Concord, NH – The New Hampshire Insurance Department has updated its listing of health care provider networks that will be available through 2015 insurance plans sold on the federally facilitated New Hampshire Health Insurance Marketplace. This is a welcome upgrade from last year, when NH had the distinction of having the fewest insurers in the federal marketplace. “New Hampshire residents will have a variety of networks and plan designs to choose from when they visit HealthCare.gov beginning November 15,” said New Hampshire Insurance Commissioner Roger Sevigny. The network information is available on the Insurance Department website at this link. People who wish to determine whether a particular doctor is included in any health care provider network should visit the insurance company’s website to view a more detailed list. New Hampshire residents are encouraged to contact the Insurance Department’s Consumer Services division at (603) 271-2261 with any questions. Law Firms included in the 2015 “Best Law Firms” list are recognized for professional excellence with persistently impressive ratings from clients and peers. The ranking reflects a high level of respect a firm has earned among other leading lawyers and clients in the same communities and the same practice areas for their abilities, their professionalism and their integrity. The U.S. News – Best Lawyers® “Best Law Firms” rankings are based on a rigorous evaluation process that includes client and lawyer evaluations, peer review from leading attorneys in their field, and information provided by law firms as part of the formal submission process. Driving in Vermont? Put Down the Phone! Driving while using a hand-held device is now illegal in Vermont. As of October 1, 2014, drivers may not use hand-held cell phones, music players, or computers. Drivers may use some mobile devices if they employ hands-free technology such as "Bluetooth" or voice activation. The new law imposes fines of up to $200. For more information on the new law, see: Vermont's Cell Phone Ban Explained, where you can also access links to frequently asked questions, and a guide from the Vermont Agency of Transportation that describes hand-free options for using a cell phone in the car. Another good resource is this broadcast from Vermont NPR: The Logistics of the Hand-held Cell Phone Ban, which describes what the law allows and does not allow. Vermont joins New York state and Quebec, it's neighbors in banning cell phones while driving. New Hampshire has a similar law that will go into effect in July of 2015. See: Gov. Hassan signs handheld cellphone driving ban in the Seacoast Online. BOSTON — Amy Campbell, principal of Infoworks!, is pleased to announce that the firm has been selected for a 2014 WebAward for development of the website maleyandmaley.com. The website entry received a "Standard of Excellence Award" in the legal category from the Web Marketing Association's 2014 web design competition that judged websites in over 50 categories on the following criteria: design, innovation, content, technology, interactivity, copywriting, ease of use. Judges comments favored the website's ability to be viewed in mobile and tablet display as well as being well positioned for search engines. Maley & Maley is a Vermont personal injury law firm located in Burlington, VT, founded by the father-and-son team of John P. Maley and Christopher J. Maley — both native Vermonters and highly regarded trial attorneys. Each Maley has been selected by Best Lawyers® as "Lawyer of the Year" for Medical Malpractice — Burlington. John in 2014 and Chris in 2015. Johnson O’Connor Feron & Carucci LLP (Wakefield, MA) and Hartnett & Company (Winchester, MA) announce the merger of their two accounting firms effective October 1, 2014. The combined firm will operate under the name Johnson O’Connor Feron & Carucci LLP (JOFC) and operate out of a new office in Wakefield at 101 Edgewater Place. Michael Hartnett, owner of Hartnett & Company, will become a partner at JOFC. All staff of the two firms will be retained and the newly merged firm will employ 40 individuals. The merger provides additional resources and expertise allowing JOFC to better serve its core client base of middle-market, owner-managed, family run, and entrepreneurial-backed entities throughout the greater Boston area. JOFC serves industries including real estate, professional services, high technology, construction, healthcare and medical/dental, retail, and manufacturing. The firm also has dedicated service teams providing employee benefit plan audits and third-party administration of retirement plans. Johnson O’Connor Feron & Carucci LLP is among the 50 largest CPA firms in the Boston area as ranked by the Boston Business Journal. Trial attorney Christopher J. Maley has been selected by Best Lawyers® as the 2015 “Lawyer of the Year” for Medical Malpractice Law – Plaintiffs, Burlington, Vermont. Best Lawyers is the oldest and most respected peer-review publication in the legal profession. Maley is an active member and past president of the Vermont Association for Justice. As chair of the organization's legislative committee, he worked to help pass House Bill 62 to prohibit the use of handheld devices while driving. The bill was signed into law by Governor Shumlin in June of this year. Maley is a Vermont native and personal injury plaintiff lawyer practicing with Maley and Maley, PLLC — a firm he founded with his father John P. Maley (who was selected for the same “Lawyer of the Year” distinction for 2014). Attorney Robert M. Higgins has been named by Best Lawyers® as the 2015 "Lawyer of the Year" for Medical Malpractice Law - Plaintiffs. Higgins is a partner with Lubin & Meyer PC, Boston, and has been selected for inclusion in The Best Lawyers in America each year since 2008. Only one lawyer in each practice area and designated metropolitan area is honored as the “Lawyer of the Year,” based on particularly impressive voting averages received during the peer-review assessments. Higgins, who achieved Massachusetts’ largest personal injury award — a $40 million verdict for a baby brain damaged at birth, is known as one of the state’s top medical malpractice trial attorneys. In 2014, Higgins secured 2 of the 4 largest verdicts — $16.7 million for a failure to diagnose lung cancer resulting in the death of a 47 year old, and $4.8 million for failure to diagnose myocarditis resulting in the death of a 23 year old. Lubin & Meyer PC is recognized as New England’s most successful medical malpractice law firm. The firm is committed to reducing the medical risks faced by patients in the states of Massachusetts, New Hampshire and Rhode Island. Can you describe the invention and its key features in no more than 3 sentences? Can you describe the business model related to the invention? What is the closest thing to your invention already on the market? Is the invention in final form or will there be continuing updates? Have you already publicized or sold the invention? For more detail and the full list of questions you need to be able to answer in depth, please see the full article here: Patent Application Tips. Medical malpractice law firm Lubin & Meyer tops the list of the largest verdicts of the year as reported in Mass. Lawyers Weekly in its mid-year issue which features the largest verdicts, settlements and government settements from June of 2013 through June of 2014. $4.8 million for misdiagnosed cardiomyopathy leading to death. Boston-area business law firm Morse, Barnes-Brown & Pendleton (MBBP) has announced it is expanding its reach to serve clients from its new Salt Lake City, Utah office. MBBP is known for serving emerging high tech and life sciences companies and their investors in the Boston area, and sees the fast-growing market in Utah and the broader Mountain West region as a natural fit. Utah has the second-fastest rate of job growth in the US, as well as first-rate universities, vibrant tech and life sciences industries, and highly educated workforce with an entrepreneurial culture. According to the firm's managing partner Lisa Warren Treannie, "Utah is a perfect fit," with the region's increasing demand for lawyers who represent high tech, medical device, and life sciences companies as well as the investors who invest in these companies. Partners Jeff Steele and Jim Kelly will head up the Salt Lake City effort. To commemorate Captain John Smith’s historic 1614 expedition and 400th anniversary of the first mapping of the Isles of Shoals, the N.H. Department of Resources and Economic Development will erect a granite obelisk and granite benches on Ragged Neck at Rye Harbor State Park, Rye, NH. The Isle of Shoals 1614 Monument, with a view out to the Isles of Shoals, will be dedicated on Thursday, August 14, 2014. This new historic monument honors the former obelisk dedicated to Captain Smith, which was erected on Star Island in 1864 to commemorate the 250th anniversary Smith’s journey. In 1614, Captain John Smith explored and mapped the local coastline from Penobscot Bay to Cape Cod. He was the first European to map the Isles of Shoals, which he named “Smith’s Isles.” While that name did not endure, with the consent of King James I, Smith named this region “New England.” John Smith’s map and 1616 best-selling book “A Description of New England” detailed the region’s teeming fishing banks, abundant game, clean rivers, heavily forested land and native people. The book was a major inspiration in the subsequent flood of English migration to these shores. It was this map that guided the Pilgrims to “Plimouth” in 1620 and led John Winthrop to “The River Charles” in 1630. The Social Law Library is hosting a continuing legal education (CLE) two-hour seminar on Data Security for Small Law Firms on May 29, 2014 at 4:00 p.m. at Special Collections Room at One Pemberton Square, Suite 4100, in Boston. What you need to know: Hackers are now targeting small law firms because of the wealth of info in client files that can be used for identity theft – in family law, estate planning, real estate, elder law and other matters. And Massachusetts law requires you to notify clients of a data breach – do you really want to have to do that? Many IT providers will tell you that you’re “safe,” but they actually provide minimal safeguards and lawyers often inadvertently undermine them. To register, go to: Social Law Library registration page. Technical revisions to New Hampshire’s Uniform Trust Code. For more information on NH's SB 289 and its affect on estate documents, please see the blog post: Bill Before NH Legislature Would Impact Estate Plans.